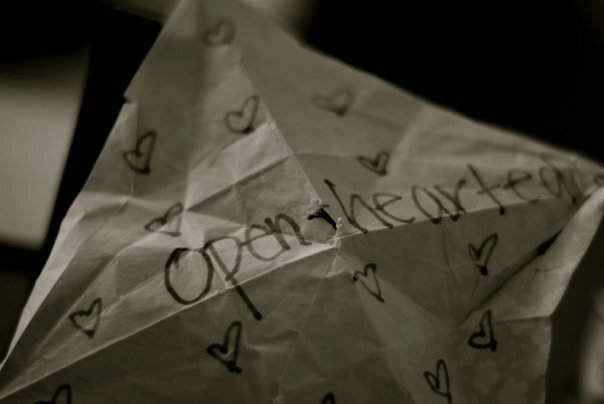 Organ donation news, features and expert insight. Staff Sgt. 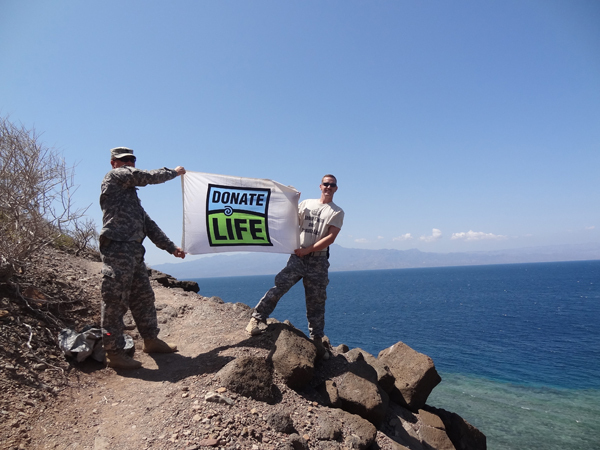 Erik Tofte honored his best friend by carrying a Donate Life Flag with him on tours of the Middle East, Africa and Thailand. Cameron Chana and Staff Sgt. Erik Tofte first met in 2006 when they pledged for the Sigma Pi fraternity at Eastern Illinois University in Charleston, Ill. Chana, of Clarendon Hills, Ill., was entering his sophomore year and eager to continue his college pursuits while serving as a member of Sigma Pi. Tofte, of Roscoe, Ill., also a sophomore but three years older than Chana, had a year of community college under his belt after coming off active duty as a member of the U.S. Army’s famed 1st Cavalry Division. They were accepted into the fraternity, and for the next three years they were college roommates and worked closely together in their various roles within the Sigma Pi fraternity house. They became brothers. It was late May 2009, three weeks after Chana had graduated from EIU. He had decided to pursue an MBA at EIU, so he stayed there after graduation with plans to start graduate school in the fall. He and about 50 others, mostly EIU students, were returning to campus on a rented double-decker bus with an open-air top after a day of boating at Lake Shelbyville, a popular central Illinois recreational area. Chana, who stood about 6-foot-3, and another man were facing backward when the bus headed under the Interstate Highway 57 overpass on Illinois Highway 16 in Mattoon, just west of the EIU campus. Chana and the other man both were killed instantly when their heads struck the overpass. Quick-thinking students gave both men CPR until first responders arrived. The students didn’t know both men were beyond saving at that point. But their actions proved to be lifesaving nonetheless. Tofte has dedicated himself to ensuring that Chana’s mark leaves a very large footprint. 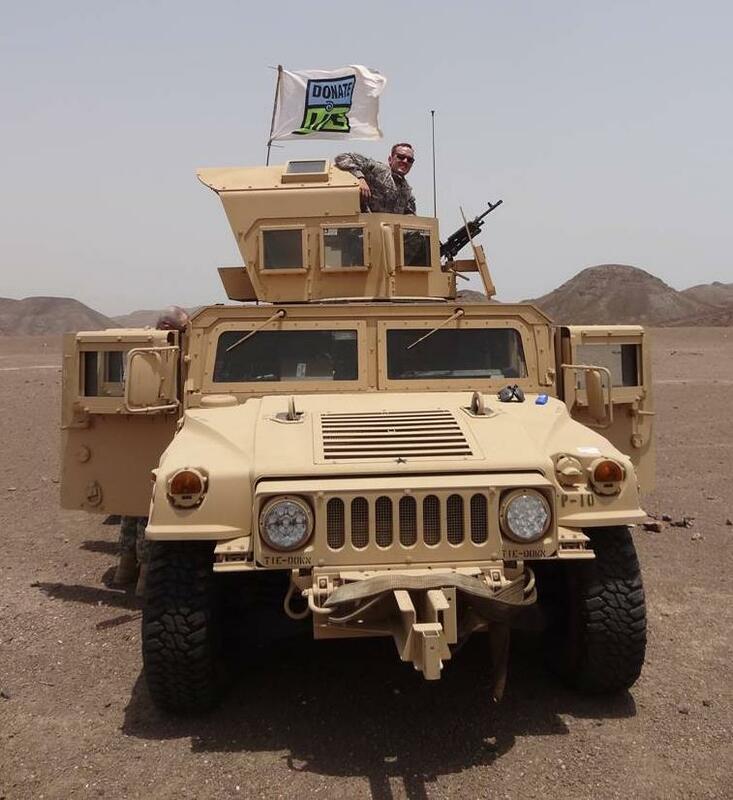 Since 2009, he has been a member of the Texas Army National Guard and has been deployed to several locations, including Africa, the Mideast and Thailand. During those deployments, Tofte took several steps to make sure the areas he visited felt his best friend’s presence and learned about the importance of organ and tissue donation. For example, he carried a Donate Life flag with him, and, taking a “roaming gnome” approach, he had photographs taken of himself holding the Donate Life flag throughout his travels. He also created Donate Life and C.L.C. (Chana’s initials) nameplates for his uniform and wore them over his regulation insignia when possible and appropriate and took more photographs of him wearing the nameplates. And he had pro-donation T-shirts made and wore one in many other photographs. He compiled many of these photographs into a photo book. 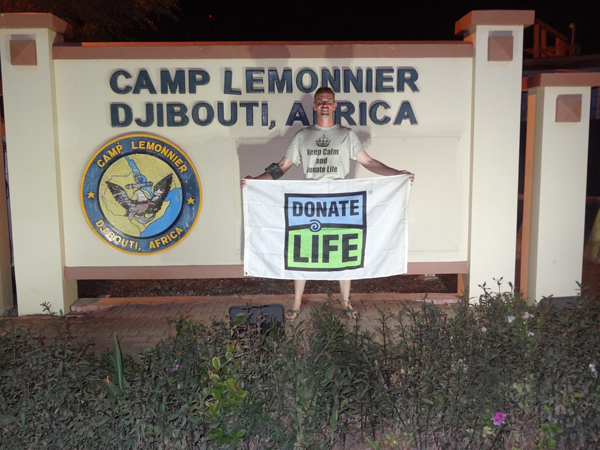 Erik with the Donate Life flag in Djibouti. See more photos of Erik, Cameron and the Donate Life flag at GiftofHope.org. 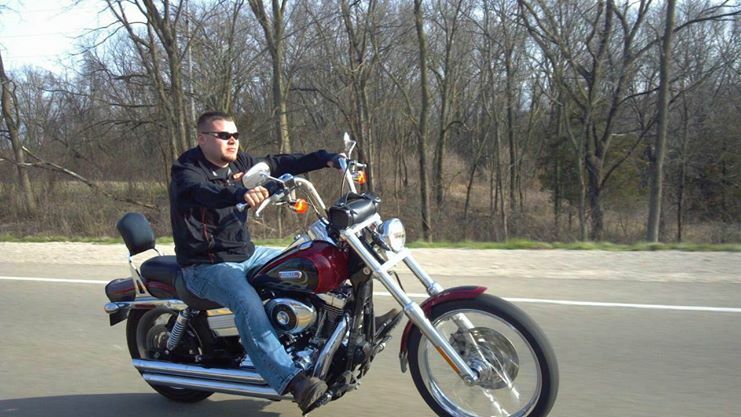 Shawn Miller on his bike. 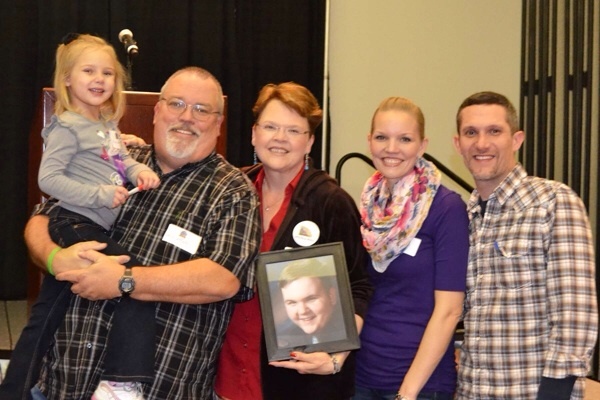 On Saturday, September 6th, the friends and family of Shawn Miller are hosting inaugural Shawn Miller Memorial Run to honor him and his gifts of life through organ and tissue donation. The event will kick-off at 11:00am at Manny’s Pizza in Savanna, Illinois. All proceeds from the event will be donated to Gift of Hope. To learn more about the event, visit the Shawn Miller Memorial Run Facebook page at http://on.fb.me/1uvqyH8. Inquiries about the event should be sent to Nathan Schnitzler at nschnitzler30@gmail.com. Cathy Stalinski is the mother of an infant organ transplant recipient and a fervent advocate for Gift of Hope and organ and tissue donation. When her baby daughter Kateri was barely three months old, Cathy and her family started on that long journey familiar to so many families waiting for organ transplants. This “road trip,” as Cathy calls it, started with tests and Kateri’s first surgery. 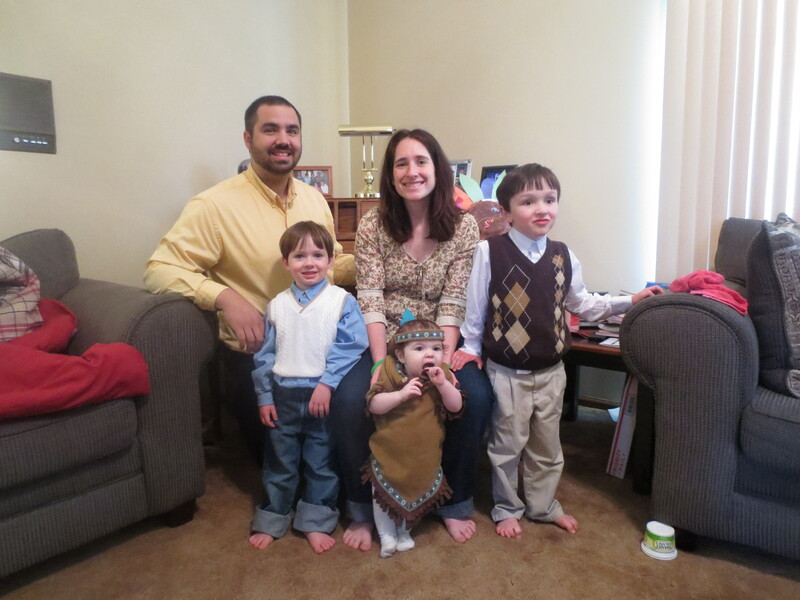 “It gave us some time, but we soon realized her liver was still failing,” Cathy said. She and her husband did their research and learned that the liver can regenerate. “So a person can give a part of their liver, and it will regrow in both people.” Cathy was a blood match and ready to undergo the needed evaluation — “ready to do anything to save my baby,” she said. 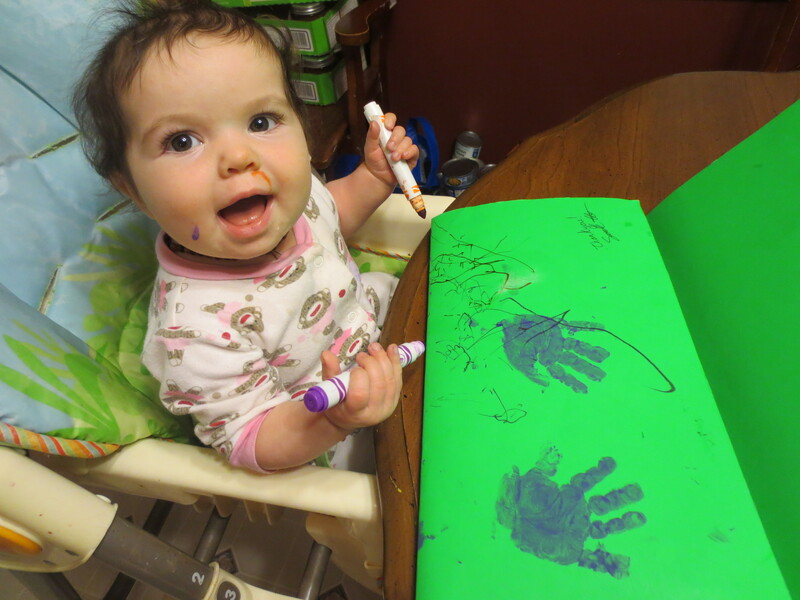 Kateri writing her donor family. Each year, Donate Life organizations from across the United States and throughout the world celebrate the “gift of life” through organ and tissue donation by creating a float to be featured in the Tournament of Roses Parade in Pasadena, California. Gift of Hope is proud to be a part of this amazing event. Over the next few days, we will feature the stories of Illinoisans and Hoosiers who are organ and tissue donation advocates and have been a part of making the 2014 Donate Life Float a reality. Today, we would like to introduce Larry Lefferts. Larry is a donor father and an avid advocate for organ and tissue donation. 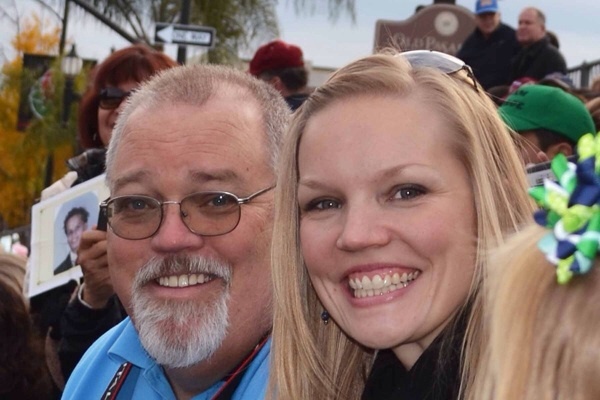 He and his wife, Vivian, represented Gift of Hope at last year’s Tournament of Roses Parade. They enjoyed the experience so much that they are returning for the 2014 parade as members of the Donate Life Float Advisory Committee. Without further ado, here is Larry’s story in his own words. The Lefferts family at the 2013 Rose Parade. The English language is far too inadequate to describe the beautiful experience of being involved with the Donate Life Float! Words like “joy”, “pain”, “comfort”, “healing”, “support”, “compassion”, “love”, “sharing”, “caring”, “thankful”, “remarkable”, “overwhelming” do not seem adequate in conveying just what this experience was all about. We met new, very dear friends who make one feel like they have been our friends for a very long time. There is Kevin Monroe, who donated a kidney to his brother and has worked on every Donate Life Float. He was in charge of a shift for building the float. After telling him Vivian was riding the float, he asked what state we were from. When we said Illinois, he said he knew about us and then said something about our fireworks business and our son. His eyes swelled with tears as we talked about John and we all cried. What compassion he showed us! 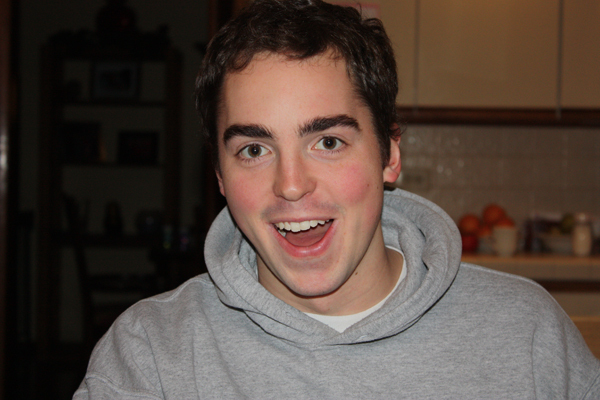 Then there is the driving force behind the float, Bryan Stewart. It was amazing to watch his skill at handling all of the things thrown at him. We also got to know Bryan’s assistant, Annie Kiefhaber, quite well. We were even able to help her with coordinating buses for the parade. And there was Heidi Schaiberger! We were so very blessed to be able to meet her and share the experience with her. The joy and anticipation on the day of the Parade was palpable! The Donate Life folks sat facing each other on both sides of Colorado Blvd which hosts much of the parade route. It was a joy watching the other floats and bands go by as everyone cheered. We could see a couple blocks up to “media corner” as floats turned towards us. There was a clear view, stirring much excitement, when the Donate Life Journey of the Heart Float turned the corner. To watch it approach us and see it so clearly was truly a life changing moment. I saw my lovely bride, Vivian, clutching my son’s photo and waving back at all of us! I was flooded and overwhelmed with emotion as I watched this beautiful creation sail by us and heard the Float’s theme song, Phil Collins’ “You’ll Be In My Heart.” I was truly blessed to be there for this moment! It was joyous! Larry and his daughter as they wait for the Donate Life Float. Vivian and I felt so very blessed! Our lives were changed on that day. We pledged to return at some time in the future and volunteer in the hopes we could again experience the healing joy. Imagine our excitement when Annie Kiefhaber called us and asked if we would like to be on her Donate Life Float Committee! We were, and are, thrilled beyond belief at this opportunity. It is our hope to make the Donate Life Rose Parade Float Class of 2014 feel as blessed as we were made to feel by those who were there for us! Since 2006, Donate Life Illinois has provided social media users with organ and tissue donation news, expert insight and engaging digital content. In that time, we built a community of more than 18,000 Facebook fans, created a Twitter presence of nearly 1,450 followers and developed dozens of YouTube videos with over 250,000 views. The look and names of these social media sites might be different, but the news, content and promotions will remain the same. Gift of Hope, in partnership with Donate Life Illinois, remains committed to creating a community of registered donors who are dedicated to building organ and tissue donation awareness across the country. Keep an eye out for new features, promotions and news regarding Gift of Hope and our social media sites! To learn more about Gift of Hope, visit GiftofHope.org! If you haven’t done so already, take 30 seconds to register your decision to save lives through organ/tissue donation at DonateLifeIllinois.org. Let others know that you’re a registered donor! Tweet and post about why you support organ/tissue donation. Not a social media fan? No problem! Tell ten co-workers, friends, or family members about why you support organ/tissue donation and why they should register at DonateLifeIllinois.org. Become a Donate Life Illinois volunteer. Learn more about the Donate Life Illinois Volunteer Program at DonateLifeIllinois.org! Advocate for organ/tissue donation in the community and in your workplace. Encourage your employer to participate in the Donate Life Illinois Workplace Partners Campaign. Or, if you’re still in school, organize a Campus Campaign that will encourage your fellow students to register as organ/tissue donors! Thanks for all of your love! Let us know how you “showed your love for donation” by posting on the Donate Life Illinois Facebook Page or tweet at us @DonateLifeIL! Monday, October 3, marked the 83rd annual celebration of Child Health Day. This brings to mind many stories of lifesaving organ transplants given to children in need. During April, we featured the story of Mia Royer, a one-year-old girl who received a lifesaving intestine transplant in 2009. 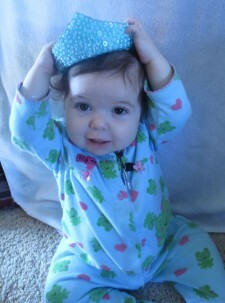 Today, she is fully recovered and living the life of a healthy, happy three-year-old. Our friends at Children’s Memorial Hospital have featured the stories of several children waiting for and receiving lifesaving organ transplants. Mackenzie Tannhauser, a 17-year-old girl from Crystal Lake, posted a video diary of her wait for a heart transplant. Her series of videos shows the “ups and downs” associated with waiting for the gift of life. Thankfully, she received a transplant last month and is on the way to leading a healthy, productive life. There’s also the story of Drew Boedigheimer, a two-year-old boy and Cubs fan who received two life-changing gifts—a new heart from a selfless donor and a visit from his favorite Cubs player, Darwin Barney. 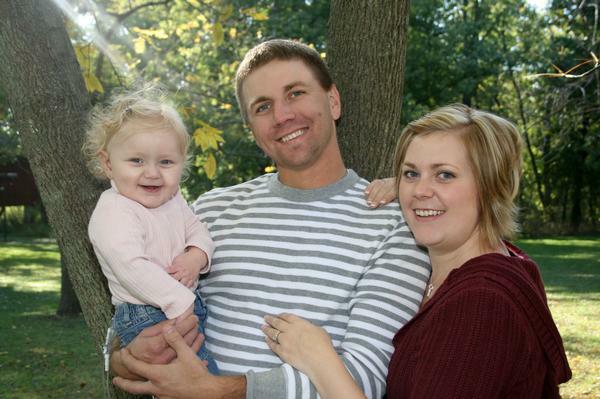 After his transplant, Drew’s doctor encouraged the Boedigheimer family to contact the Cubs to set up a visit from Barney, their rookie second baseman. The Cubs were more than happy to accommodate the request, and Barney paid a visit and help raise Drew’s spirits. Watch Drew’s story at WGN.com. Stories like this are made possible by people who make the decision to be registered organ and tissue donors. 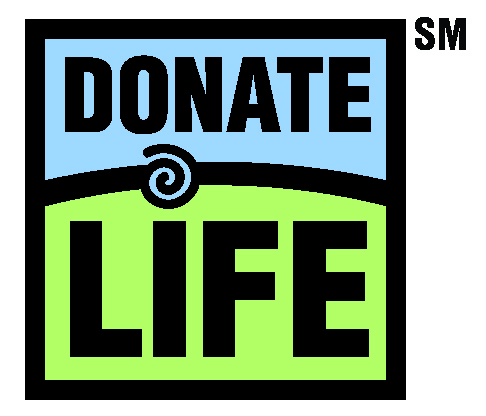 Learn more about how you can help save lives through organ and tissue donation at DonateLifeIllinois.org. It takes just 30 seconds to register. It’s an ordinary action that can produce extraordinary results. Gift of Hope Organ & Tissue Donor Network is a not-for-profit organ procurement organization entrusted with coordinating organ and tissue donation and providing donor family services and public education in Illinois and northwest Indiana. . This blog focuses on outreach initiatives, expert insight and commentary pertaining to the organ/tissue donation community. Illinois and northwest Indiana residents can REGISTER HERE. Click Here to learn how to register in your state.